5 kids arrested on Monday at or by the train/tram. They are from off island but apparently they beat and robbed a young woman who lives here. Also last Friday there was a report of 2 kids robbing a woman on the island for her phone. I am not sure if those 2 kids from Friday and the 5 kids from Monday are connected. But I feel like no one knows about it and we should. Fridays incident happened on the bus. I am not sure if its the red bus or the 102, but the kids ran into the train. 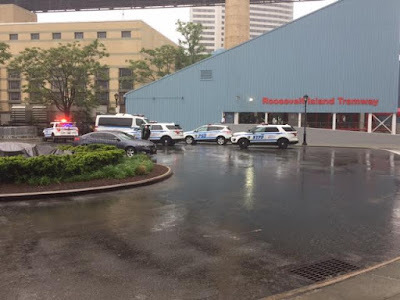 According to a NYPD Spokesperson, on Monday, May 22, at approximately 2:30 in the afternoon, 5 teenagers between 13- 17 years of age approached a 28 year old woman standing at the Roosevelt Island F Train Station Manhattan Bound platform. The Queens teenagers, 4 female and 1 male, surrounded the Roosevelt Island woman, robbed her of an Iphone and roughed her up causing bruising and lacerations. According to Roosevelt Island Public Safety Department (PSD) Director Jack McManus, following the incident, the woman canvassed the area with Public Safety Officers and spotted the teenagers at the Tram Station where they were arrested by PSD. Chief McManus and Deputy Chief Kevin Butler also reported a previous incident of a stolen Iphone occurring after school on Friday afternoon, May 19. According to Deputy Chief Butler, 2 kids, 12 years of age or younger, robbed an Iphone from a bus passenger and escaped into the Roosevelt Island F Train subway station. They were not caught. PSD is not sure if the robbery occurred on a Red Bus or NYC Q102 Bus. Chief McManus says the two incidents are not related and not part of any organized gang. They were opportunistic crimes he said. Chief McManus discussed these two incidents at the Roosevelt Island Residents Association (RIRA) Public Safety Committee meeting last night.